Learning to play the blues is often a major aspiration for guitar students (I know it was for me). Playing the blues is not very hard from a technical standpoint, but getting the feel, the rhythm, and the embellishments right is another story. 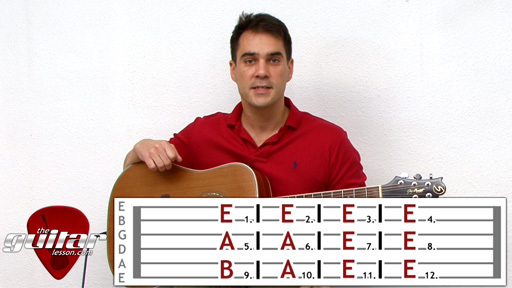 This guitar lesson will teach you a 12 bar blues guitar solo in the key of E. This is more of an acoustic blues solo, but go ahead and learn it even if you have an electric guitar, it'll still sound great! Our 12 bar blues guitar lesson is broken up into several sections. First of all, you'll learn about just what the 12 bar blues is, and also what chords you'll be using in the key of E. As you might know, the 12 bar blues uses the I, IV and V chords of a given key. In our case, we're in the key of E, and your chords will be E, A and B. Afterwards, you'll learn a neat turnaround you can use to start the song with. You can start the song with playing the turnaround as well, it's up to you. After the turnaround, you'll learn every bar of this 12 bar blues tune bar-by-bar, note-by-note as always. You'll be using lots of lead guitar techniques in the process, including slides, slurs, hammer-ons and pull-offs, so if you're not familiar with them yet, you might want to go back to our basic lessons on lead guitar techniques. After you learn all 12 measures, we'll touch just slightly on the importance of learning pentatonic scales for blues. To get a full picture, please check out this lesson on the pentatonic scale, and this one on the 5 shapes of the minor pentatonic scale. Blues, rock, pop, metal, jazz, so basically all music that you can think of uses the pentatonic scale, so it is important to learn if you want to start playing the blues and improvising. Sorry, but you've reached a premium content area. The download of the 12 Bar Blues tablature file is only available to premium members. Sorry, the same goes for the backing track. To download the backing track to 12 Bar Blues, please log in and revisit this page. Is th 6th bar in A or is it actually E, im a novice, so i’m just trying to be sure. Hi there, the 6th bar is on A.